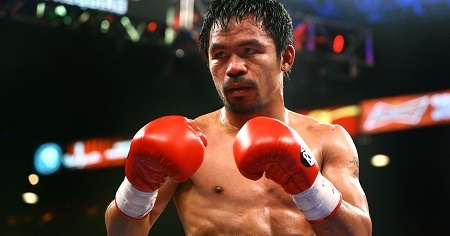 Legendary boxer-turned-politician, Manny Pacquiao is set to start life as a congressman after securing enough votes to guarantee a seat in the Philippine Senate. According to election results conducted in the upper house Senate in Philippine, boxing hero Manny Pacquiao is set to win a seat when results are announced. With over 93 per cent of voting centres accounted for from Monday's polls, the winner of an unprecedented eight world championships had garnered 15.2 million votes, more than enough to enter the Senate. Pacquiao, 37, had a tough life and lived on the street before boxing his way to fame and has now become one of the country's biggest stars. He retired from boxing last month to start life as a fulltime politician. His aim is to become the president of his country. According to available statistics, AFP reports that Pacquiao placed eighth out of a field of 50 candidates in a national race where the top 12 win a seat in the upper house, a powerful legislative body that has often served as a springboard to higher office. Pacquiao who dropped out of school before finding success in sports is set to start life as a congress man.